January is National Braille Literacy Month and we're excited to learn more about what makes braille so important in today's society. There’s so much technology around in today’s society that it's no wonder there doesn’t seem to be a need for learning braille. There seems to be this idea surrounding braille that it’s no longer useful in contemporary society, and that it doesn’t have as much value nowadays, but is that really true? As a blind person myself, I think braille is an important skill to have. I started learning braille when I was around 4 years old (possibly even younger) and I’ve used it ever since. Granted, I am at university and don’t use it as much now as I used to, but I’ll always have the invaluable skill. 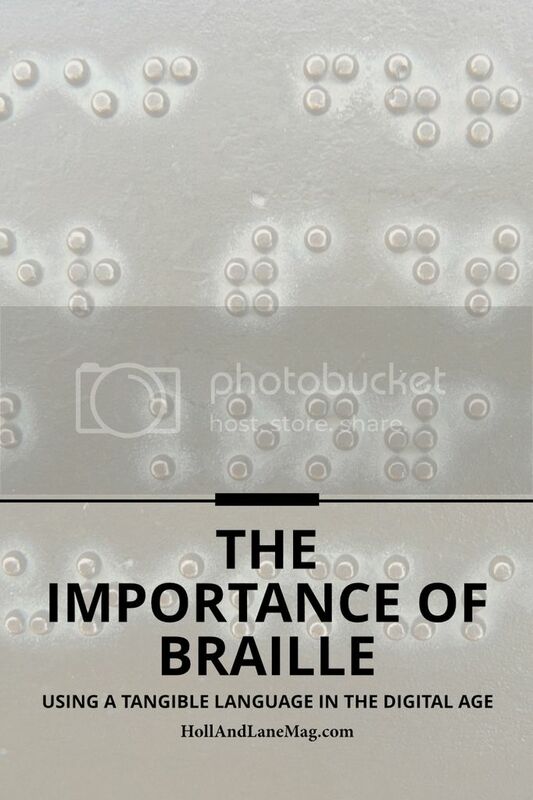 I wanted to tell you why I think braille is important. Braille is like learning another language, it’s like a secret code that fewer people seem to learn nowadays. It can take a long time to learn but when you’ve learned it, it’s such an achievement. Braille has two grades: grade 1 and grade 2. Grade 1 is where everything is spelled out letter by letter, word by word. Grade 2 braille is possibly more fun but more challenging: it involves contractions and word signs. You’re probably wondering what on earth a contraction is? Well it’s a shorter formation of a word or part of a word, for example the word ‘and’ is a series of 5 dots and that’s it. So the positive of learning contracted braille? It’s quick, simple (when you know how) and can be faster to read than your grade 1 braille. One of the most important aspects about learning braille is literacy. It’s all well and good listening to audio and other formats for hours but that doesn’t help you with sentence structure, word formation and punctuation. These are things that can only be taught through writing. So for blind people, this can be done by learning braille. Many blind people love music, just like their sighted peers. When it comes to learning an instrument and reading music, this is possible for blind people to do by using braille. There’s music software available, but there’s nothing like feeling the dots under your fingertips. Personally, I think reading the music helps you retain it better. Braille is also useful in public places. It’s often all around us; in lifts, on toilet doors and on tactile maps. Having the ability to read it in public places means that it gives you more independence and you don’t have to rely on others. Granted, it’s not everywhere but it’s a useful skill to have when you can use it. One of the important factors about learning to read braille is being able to identify products that have braille on them. The majority of packaging doesn’t, but a lot of medication have braille labels and it’s also really easy to make your own braille labels for products around the home. It’s a quick and easy way for people to identify products. It can be especially useful for those who have limited vision. For students, braille can be extremely useful when revising for exams. There’s so many ways of creatively revising with braille such as making short revision notes, and making flashcards. It can be great for organization too as you can braille yourself a revision timetable to put up and it’s something that you can refer back to it easily. One of the most important skills when learning braille is that it’s such a unique skill to have. Whether you learn uncontracted or contracted braille, it’s a skill that’s really hard to find nowadays. You may never know when you may need to use braille, especially if you’re a blind or visually impaired person! Holly is a 21 year old blind student and blogger from the UK. In her spare time she enjoys hanging out with friends, writing, reading and listening to music.